There are more than 20,000 manufacturing companies in Florida? For 8 years, Florida has created new jobs in manufacturing every single month? Tampa Bay employs more than 60,000 individuals in manufacturing careers? Your sponsorship is an investment in a strong, expanding, in-demand industry! Don't miss your opportunity to be part of the movement of Florida's future. 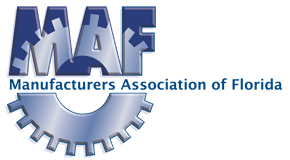 As a sponsor of the 2018 Manufacturing Exchange, you will have an opportunity to position your organization as a leader and supporter of the manufacturing industry in important markets. You are strongly encouraged to have a Twitter handle. Clickthrough link on MAF website, signage through the event, one (1) set of marketing labels of conference attendees post event, one (1) promotional item in attendee swag bag, name and logo recognition in applicable issues of MAF newsletters, Facebook & Twitter, introduction during opening and closing session, and conference sponsor slide. Clickthrough link on MAF website, signage through the event, email distribution list of conference attendees post event, one (1) promotional item in attendee swag bag, name and logo recognition in applicable issues of MAF newsletters, Facebook & Twitter, introduction during opening and closing session, and conference sponsor slide. For questions and more information, contact MAF Executive Director, Amanda Bowen at [email protected].